LANCASTER, Calif.–The Antelope Valley Transit Authority is working on providing the most convenient bus schedule to accommodate veterans who need a lift down to the West Los Angeles Veterans Administration Medical Center. To help inaugurate the new service, which provides greater access to health care for local veterans and active duty service members, Rep. Steve Knight, R-Calif., an Army veteran who sits on the House Armed Services Committee, joined representatives from different branches of the armed forces recently on a trip aboard the bus down to the VA facility, located at 11301 Wilshire Blvd. “Ensuring that our local heroes receive the medical treatment they need from the VA is a passion of mine,” Knight said. 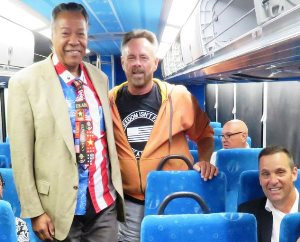 Rep. Knight and the veterans, along with regular commuter passengers on their way down to Los Angeles, enjoyed a comfortable ride and free Wi-Fi on AVTA’s air-conditioned 45-foot bus. The agency operates a fleet of 30 commuter buses, making daily trips from Lancaster and Palmdale down to Los Angeles, Century City and the San Fernando Valley. “We think helping veterans get to their VA appointments is really important,” added Marine Corps veteran Kevin Sanders who joined Knight on the trip downtown. With the Antelope Valley’s large veteran and active duty military population, the connection to the largest veteran facility in the VA health care system is intended to provide a needed transportation solution for veterans who cannot drive themselves, or do not have access to a ride. 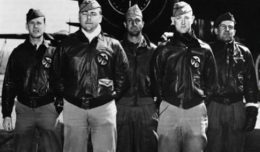 With a cost of $10.50 round-trip, veterans and active duty personnel with military I.D. or an AVTA-issued military card can take the bus from Sgt. Steve Owen Memorial Park in Lancaster at 5:20 and 5:40 a.m. and the Palmdale Transportation Center at 5:35 and 6:00 a.m.
Returns trips to the Antelope Valley will depart the VA at 3:35 and 4:05 p.m. In the event that health care services extend beyond the time frame of return departures, AVTA and the Veterans Administration will work together to ensure that patient has transportation back home to the Antelope Valley. Run #4 – Departs Owens Memorial Park at 5:20 a.m. and departs Palmdale Transit Center at 5:35 a.m., arrives at VA at 7:58 a.m.
Run #5 – Departs Owens Memorial Park at 5:40 a.m. and departs Palmdale Transit Center at 6 a.m., arrives at VA at 8:23 a.m.
Run #4 – Departs VA at 3:35 p.m., arrives at Palmdale Transit Center at 6:36 p.m. and arrives at Owens Memorial Park at 6:51 p.m.
Run #5 – Departs VA at 4:05 p.m., arrives at Palmdale Transit Center at 7:13 p.m. and arrives at Owens Memorial Park at 7:28 p.m.